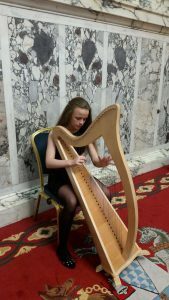 Our second introduction to one of our Scór na nÓg participants is Lára who is entering two categories representing St. Brigid’s GAC, solo singing and recitation. We are delighted to have the very talented Lára on board who is no stranger to the stage and she is practicing away before the big event November 6th in Moneyglass. Best of luck Lára from Brigid’s GAC members, players and the wider community.